e. In the image insert dialog, click on the folder icon and select your image. 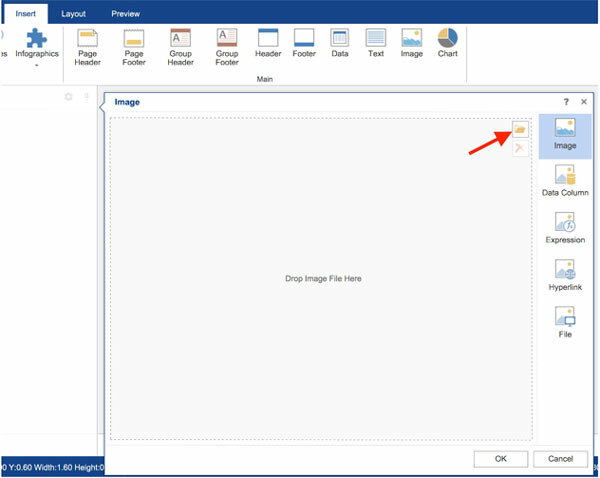 Once you select the image, you can preview it in the image select dialog and after you click on OK button it will be inserted into your report. f. Now your header section is done and we can continue to enter the historical data table into the report. Every table has 3 sections: Header, data and footer. First we will enter header into the report. To do so click on the Header button and then click on the report. Also add texts into the header section as shown in the image.